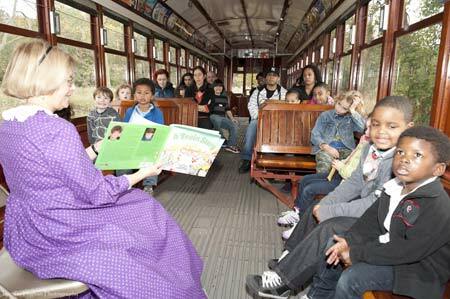 This exciting program provides an opportunity for children 4 to 8 years of age to listen to a story in a real trolley car. The day begins with a trolley ride at 11AM (please be on time!) along our trolley line through the salt marsh, possibly seeing osprey, herons, egrets, swans and other wildlife, before returning to the trolley yard. Here, board our historic “Story Trolley” to listen to each week’s children’s story, read by one of our volunteer educators, followed by time to explore the other trolley cars on display. In addition to the reading program, each child will receive a snack and a drink. You can also bring your own lunch to enjoy at our picnic area. A parent or adult chaperone is required to accompany all children. Each week we will read from different stories – come check them out!